There comes a time in most indoor cats’ lives when the vet kindly points out that they could do with losing a little weight. Hey, it happens to the best of indoor cats — but that doesn’t mean that you, as your cat’s guardian, can’t take your share of the responsibility and step up and add a few easy exercise-based activities to the daily routine. It’s trust building and engaging to have a cat eat treats directly out of your hand — but when you’re dealing with an indoor cat that could do with slimming down a little, it’s best to turn treat time into cardio time. 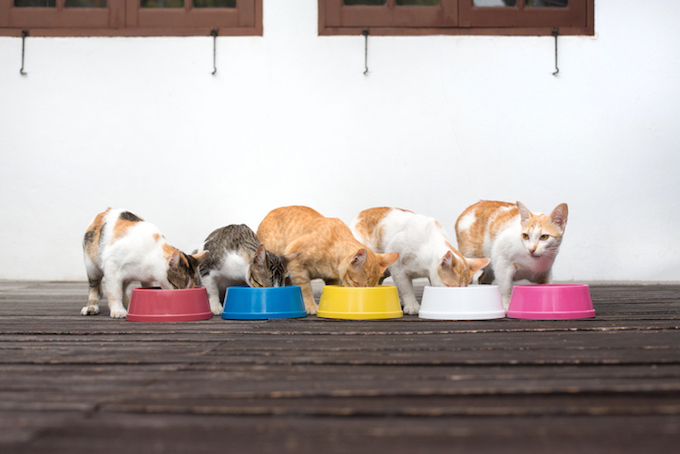 Most cats instinctively know when it’s meal time — and they will follow you around as you prepare their feast. So why not use that dedication as a way to get them to up their daily step count? This works particularly well with wet food: Once you’ve placed the grub in the cat’s dish, walk around your abode, enticing your cat along as she smells the food while engaging in a sneaky little pre-meal walk. With my own cat, I’ve currently settled on five laps up and down the living room before she gets to chow down. 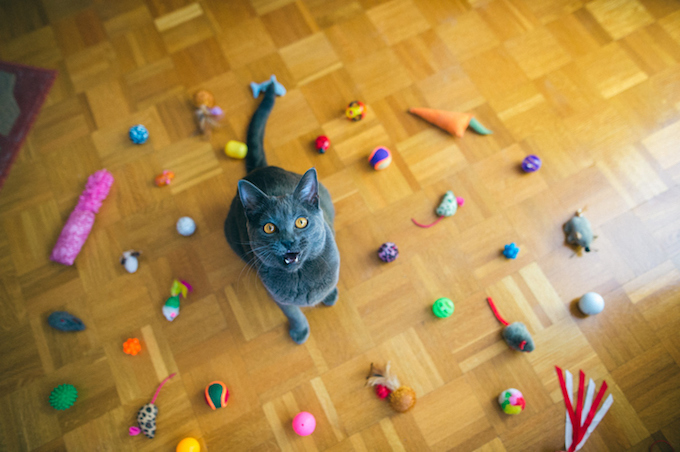 We all know that cats can have finicky relationships with their toys. But if your feline loves to bat a certain type of ball or small toy around, you can up their exercising by strategically placing the toy on higher up surfaces. The back of the couch, on the corner of a desk, or perched on a chair are all great spots. Not only will the cat be enticed to hop up and grab the toy once she notices it, but once it’s been batted onto the floor, your cat has to drop down and continue the play session. If you have a cat tree in your home, you can easily exercise your feline by making her climb up and down the carpeted monstrosity as she chases and stalks her favorite toy. This works best with toys that you can dangle along, like a Cat Dancer or one of those fishing pole-style toys that come with fake birds or feathers on the end of it. 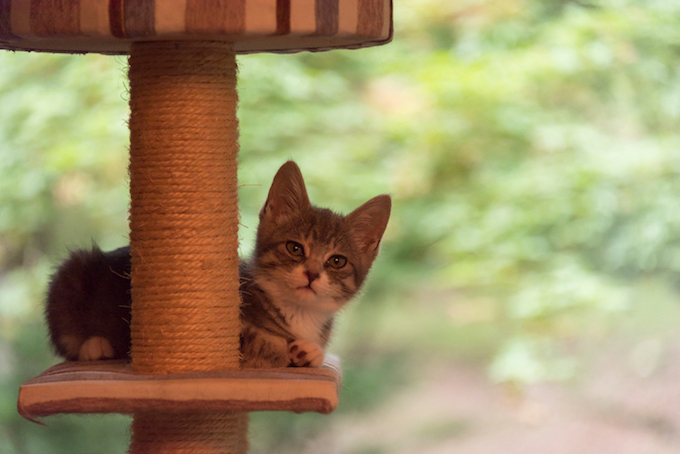 The key here is to get your cat climbing up and down the cat tree as much as possible — although don’t forget to let her “catch” the toy from time to time so that she doesn’t lose interest. Remember: Cat trees aren’t only just for lounging. Finally, take a look at your furniture set up and see if you cannot move a few items to create some natural steps and levels that your cat can climb up and down. 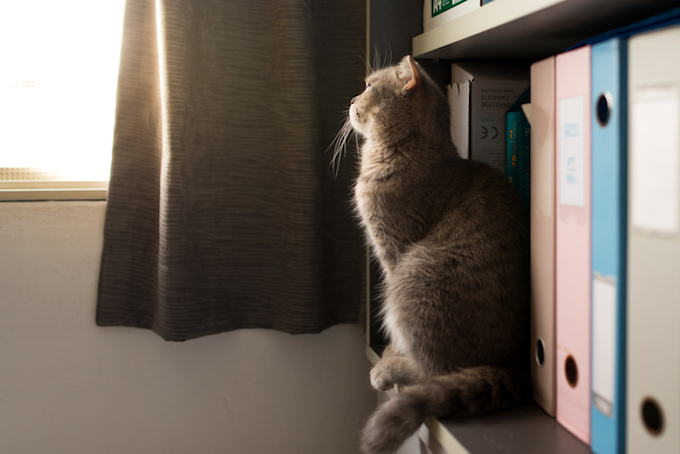 An easy hack is to clear some space on a shelf on a bookcase to fashion a nook that your cat can spot and aim to check out. Tap into your cat’s curiosity to prompt them to exercise while exploring. Do you have any indoor exercise tips for others? Please share!